There are two acne treatment camps. And the camp that prefers the natural ways to get rid of acne. Both camps get results, but at what cost? Commercial product users run the risk of using a cream that can cause serious side effects like Crohn’s disease, depression, and birth defects. 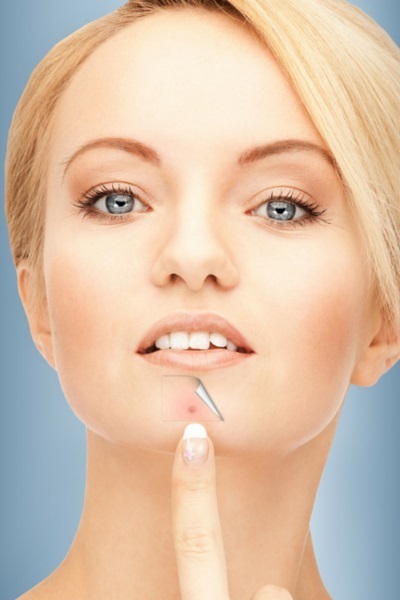 While natural acne treatments offer far fewer and less serious risks. We fully support the argument that natural acne treatments are the best way to get rid of acne – no matter the type. But we also know that not all natural acne treatments are created equal. Some are simply more effective than others. If you’ve ever wanted to know the best treatments for how to get rid of acne naturally, then you’ve come to the right place! Below, you’ll find our list of the fifteen most effective ways to treat your acne without having to douse your body with chemicals. Aloe contains a compound called saponin. Saponin contains anti-inflammatory, antibacterial, and antifungal properties – all of which kill bacteria and protect skin. How to Use It: It’s more “what to buy.” Find an aloe vera lotion that is ALL NATURAL. Our favorite is Earth’s Daughter’s Aloe Vera Gel. Apple Cider Vinegar. In another article, we covered a wide range of uses for AVC ­– one of those being to treat acne. Apple cider vinegar adds acidity back to your skin, which protects it from bacteria. Add one part ACV to one part distilled (or filtered) water. Dab with a cotton ball. Apply over the skin surface. Let it sit for approximately 30 minutes. Baking Soda. Baking soda is unique in that it can either be an acid or a base. Which means it can help balance unbalanced pH levels in your skin (a major contributor to acne). It also removes excess oil and exfoliates. Mix 1/3 teaspoon of water with 1 teaspoon of baking soda. Apply it to the target area(s). Let it sit until it completely dries (about 5-6 minutes). Certain Natural Foods. There are specific foods that can help your acne when consumed. They include fish oil, berries, green leafy vegetables, and eggs (w/ omega-3). All of them provide essential antioxidants, nutrients, and minerals that help protect skin and prevent inflammation. Coconut Oil. Coconut oil contains capric acid and lauric acid – both of which are antimicrobial agents. It also contains vitamin E and certain anti-inflammatory properties that clears poor blockages and prevents inflammation. Purchase a container of organic coconut oil from a whole foods (or similar) retailer. Then, as needed, apply the oil to your skin. Let it rest for a couple of minutes, and rinse. Egg Whites. Egg whites have been used for ages as a home remedy for treating acne. They contain properties that lift dirt from pores and remove excess oil from the skin. They’re also believed to help tone your skin (making it appear more youthful). Crack one egg and separate the yolk from the egg white. Beat the egg white until it’s slightly fluffy. Then, using a cotton ball, apply the egg white to your skin. Let it sit until it dries. Then rinse with lukewarm water. Enessa Clove. This is how to get rid of body acne and cystic acne. Enessa clove is an all-natural, medicinal blend of clove oil and jojoba oil that kills bacteria, reduces redness and inflammation, and moisturizes skin. This is the only commercial topical-blended solution we recommend because it works! Fermented Cod Liver Oil. Cod liver oil is very high in vitamins A and D. Vitamin A is often used in big name acne treatment brands like Retin-A Micro. Fermented cod liver oil has a better grade of vitamin A than regular cod liver oil. Fermented cod liver oil comes mainly in liquid form. It can be taken by itself or mixed in with other foods. Green Pasture’s Fermented Cod Live Oil is by far the most highly regarded brand. Garlic contains arguably one of the most powerful antioxidants in existence, sulfuric acid. This antioxidant not only fights harmful free radicals, but also has antiseptic, anti-viral, and anti-fungal properties. It’s best when consumed raw. Scientists recommend two cloves of garlic per day. However, if you can’t consume it raw, then cooked in your favorite dishes will do the trick, too. 10. Honey is the most popular agent used in creating natural acne masks. It’s acidic in nature, which replenishes the acidity removed via washing with chemical-based products. It also contains anti-inflammatory and antiseptic properties. Honey is the base for several different types of natural acne masks. It can be combined with sugar, salt, oatmeal, yogurt, strawberry, baking soda, and others. In most instances, a tablespoon of honey mixed with the other agents is more than adequate. 11. Lemon Juice. Want to know how to get rid of a pimple fast? Lemon juice is the answer. It contains large quantities of L-ascorbic acid. This particular acid has two properties that allow it to effectively dry out acne and help fight bacteria. Squeeze a tiny portion of natural lemon juice into a bowl. Dab a Q-tip or cotton swab into the juice and apply it to the affected areas. Let it sit for approximately 30 minutes before rinsing. Do NOT apply it across your entire face. 12. Oatmeal. Yep, you don’t have to eat oatmeal to reap the benefits. It’s a natural exfoliate and can soak up acne-producing oil and bacteria. It’s often used as a base with other natural acne treatments, like baking soda and honey. Cook the oatmeal like you normally would (with water). Let it cool down to room temperature. Then, apply the oatmeal to your face (as a mask) and let it sit for around 15-20 minutes. 13. Sugar Scrub. Sugar is a popular option for exfoliating skin because it’s not as harsh as other exfoliates (i.e. nuts, salt, and shells). It’s primarily used in combination with other soothing natural acne treatments, like honey. Brown sugar is the preferred sugar to use. Simply mix a bit with a secondary agent (i.e. honey) until you have a thick mask-like texture. Then, apply the mask to your face; let it sit for 10-15 minutes, then rinse. Tea tree oil can be found in any natural or organic-based market or vitamin shop. Just make sure it’s 100% tea tree oil. It can be used as a spot treatment (applied directly to affected areas) or used in a mask or scrub (mix 4-5 drops with other natural acne agents). 15. Wash Your Pillowcase. Pillowcases can cause acne mechanica – acne caused by objects touching your face. The basic premise is that the dirt and grime and oil that are transferred from your head and face can linger and be transferred back to your face, causing your pores to clog. There are two different ways you can tackle this issue: 1) Wash your pillowcase every 2-3 days. 2) Have multiple pillowcases that you swap out every 2-3 days (and wash as needed). Do you have something in your mind to share or you want to resolve any of your acne queries? We want to hear from you. Please leave a comment below or contact us through our contact form.